Opened back in 1966, Rendezvous is the island’s first true boutique hotel. 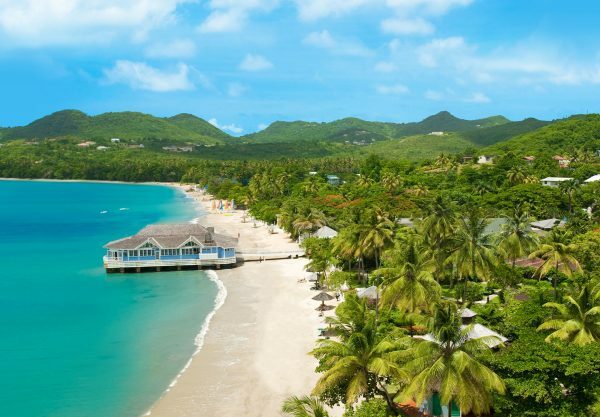 A true adults-only paradise which showcases the natural beauty of St Lucia with elegant styling and exceptional service. The experience has been designed with you in mind and even to this day it remains the perfect place for couples to escape and leave their stresses and worried behind. Set on the beautiful Malabar Beach, with soft sand and sparkling blue waters at your beck and call, you can enjoy exquisite cuisine, lavish and spacious rooms, lush private gardens for you to wander with your other half, a lazy river that winds its way leisurely through the grounds and even a brand new spa where you can enjoy a spot of pampering. This really is one of the gems of the island, all wrapped up in a family-run and friendly atmosphere. The resort also offers plenty for the more active travellers – from hiking to cycling to water sports, and because Rendezvous is all-inclusive, you can enjoy everything you may want or need. So come and rediscover life’s simple pleasures together. The rooms at Rendezvous are all decorated and finished to a high standard, with a simplistic feel to them combined with cool colours and pastel tones, creating a thoroughly relaxing place to be. They include a number of amenities as standard including air-conditioning, king size four poster beds, private en-suite bathrooms, telephones, clock radios, CD players, hairdryers, hospitality trays and a private terrace or balcony. Some rooms also feature refrigerators and ipod docks. All rooms are designed with couples in mind and sleep two people. Premium Ocean View Room – Newly refurbished and offering lovely views out over the tropical gardens from your own patio of balcony. They are situated in a three-storey Caribbean-style building and the rooms offer spacious storage space and now have upgraded mattresses and pillows to give you the best night’s sleep you’ve ever had. Verandah Suites – Found in a two-storey building overlooking the gardens, these rooms feature large balconies complete with stylish teak furnishings. Fine details are everywhere from fluffy pillows to Spanish marble bathrooms. There is even an oversized loveseat to share special moments with your loved one in your lavish suite. Seaside Suites –Newly refurbished these ground floor rooms all give direct access out onto a private decking overlooking the gardens, pool and the sparkling Caribbean Sea beyond. Italian marble is found throughout and the en-suite is spacious enough for double vanity units and even a dressing table. Sheer canopies hang from your king size bed instilling a real sense of romance. Luxury Beachfront Rooms – Situated in the three-storey building right on the beachfront, these large rooms enjoy stunning views out over the ocean. Filled with luxurious hardwood furnishings including a large dresser, desk, lounge chair and ottoman to accompany the king size bed. Sleep-comfort mattresses ensure a comfortable night’s sleep while glass and marble adorn the bathroom. Out on your terrace or balcony you can enjoy your very own sitting hammock. Beachfront Cottages – Beautifully decorated and right on the sand, they are finished with gingerbread fretwork and surrounded by lush gardens lending them privacy while being mere steps from the sea. A selection of woods comprises the flooring and furnishings, and vaulted ceilings add space and airiness to your room. Patios come complete with loungers and teak coffee tables/chairs from which to enjoy the sensational views. Luxury Beachfront Suites – Rendezvous’ largest rooms and found in the same building as the Luxury Beachfront Rooms. They feature a split-level design and have fine furnishings including a wet bar and comfortable sofa. The en-suites feature a shower as well as an elegant bathtub. Out on the terrace or balcony is a small sitting hammock from which to admire the lovely views. Great food is an integral part of a lovely holiday, and is an integral part of the Rendezvous experience. The hotel has created a range of restaurants and bars in which to enjoy each other’s company, and of course the fine food. Suitable for every taste and mood, there is casual fare at the Terrace Restaurant and a la carte elegance at the Trysting Place. The three bars at the hotel are perfect for kicking back during the day and cooling off with a soothing cocktail, or enjoying before dinner drinks, while the lively Champagne Bar stays open until the last guests leave. Terrace Restaurant – At the heart of the resort, the Terrace Restaurant showcases international flavours as well as local dishes for you to enjoy. There are buffet and made to order options for breakfast and lunch. At dinner it becomes a candlelit delight and there are theme evenings for you to enjoy as well as freshly caught fish. The Trysting Place – Serving the finest cuisine paired with excellent wines, The Trysting Place features bone china, crystal, luxury linens and the soothing background sounds of a resident guitarist. The menu is an exciting fusion of French and Caribbean flavours. Open for dinner 6 nights a week. Note the menus are subject to change. The Terrace Bar – Opening early to catch the few guests wanting to watch the sun rise, The Terrace Bar is the social hub of the resort with a throng of activity through the day as coffee leads to the first drink and then into afternoon tea and beyond well into the evening. The staff are on hand to mix you whatever you fancy! The Pool Bar – As the name suggests, you can swim up and order what you fancy while the shade and cool waters provide welcome respite from the warm Caribbean sunshine. A great meeting spot where you can trade tales with your fellow guests or the friendly bar staff. The Champagne Bar – Filling up after dinner, with music filling the air, it’s a great place to unwind and enjoy the atmosphere. Or if you’re feeling brave you can sing along to your favourites – people may even join in too! The pools at Rendezvous are unique in that they are more of a river – with loops and meanders around the resort created secluded pools and islands for you to escape, or find a day bed and catch some a few special moments with your loved one. Close to the sea the pool has a dedicated pool bar and is the perfect spot to be sociable. For those who love to keep active there is a great range of water sports to enjoy at Rendezvous including waterskiing, wake boarding, tubing, windsurfing, hobie cat sailing, kayaking and use of pedalos. There is even the chance to take some lessons if you would like to learn something new, or even just improve your skills. There is a PADI dive centre on site offering the chance to learn how to dive with the opportunity to gain a diving certification after completing a course. These are available at an additional cost and once you are qualified you can go on boat dives up to 10m depth. If you prefer to keep your feet dry there is always lots of fun and action the beach with games every afternoon. They are a great way of meeting new people as teams are always a mix of people! There is also Tennis with personal tuition available, archery, guided cycle tours, table tennis, a selection of board games, a golf clinic with expert tips available and a putting green and other great activities such as dancing and mixology at the bar so you can learn to mix your own cocktails when you get home again! The well-equipped fitness centre offers guests a range of cardiovascular and resistance machines as well as free weights and classes in aerobics, tai chi, aqua aerobics, yoga and pilates and morning/sunset walks. Also available for your use is a foreign exchange service, a tours and activities desk for organising excursions and a boutique with a range of products for sale. The gorgeous spa at Rendezvous is part of the Water Garden and is located in a beautiful dedicated building. The jewel in the crown, they offer a great range of treatments, while the staff have been trained at the sister property – The BodyHoliday – voted the best spa hotel in the Caribbean. You can take advantage of simple pleasures like manicures and pedicures or something truly special for the pampering experience of a lifetime. As Rendezvous is a resort dedicated to couples, children are not accommodated and as such there are no facilities for them.